IN A recent video Jeremy Sciarappa, a YouTuber, flips the lid off a red box in his living room to reveal a silver machine the size of a shoebox, whining noisily. The contraption is an Antminer S9, sold by Bitmain, a Chinese firm. Its job is to help validate transactions conducted in bitcoin, the world’s best-known crypto-currency. Because bitcoin has no central authority, it relies on its users to keep things humming along. Those who help out are granted bitcoins, in a process called mining. The Antminer s9 is beloved of hobbyist miners worldwide. Nestled inside are 189 application-specific integrated-circuit (ASIC) chips, designed by Bitmain to solve bitcoin’s cryptographic puzzles as quickly as possible. They were made by TSMC, a giant Taiwanese semiconductor firm. Mr Sciarappa and his fellow enthusiasts are a 21st-century version of the “49ers”, the young men who rushed to California in 1849 to try their luck digging and panning for gold. Few hit it rich, but the businesses that helped them on their way profited handsomely. Cornelius Vanderbilt sold them steamboat tickets, for example; Levi Strauss supplied “dry goods”, including combs and bedding; and lesser-known firms sold the basic shovels that miners needed for digging. History repeats. Bitmain is a miner first and foremost, but also sells what might be termed crypto-shovels. It is privately held, with profits thought to be around $3bn-4bn. It is one of three types of supplier to benefit from the crypto-rush. Once upon a time you could give mining a shot with nothing more than a plug socket, some free software and a computer. But as the prices of crypto-currencies have risen, so too has the demand to mine them. Bitcoin’s design means that as more people contribute to the mining effort, its difficulty rises. That has made mining on general-purpose hardware inefficient. Since 2011 miners have used specialised gear, culminating in the super-efficient ASIC chips of the sort found in the Antminer s9. Unlike the chips in desktop PCs, which are jacks-of-all-trades, an ASIC is designed to perform a single task as efficiently as possible. These chips quickly solve the cryptographic puzzle needed to mine bitcoin. 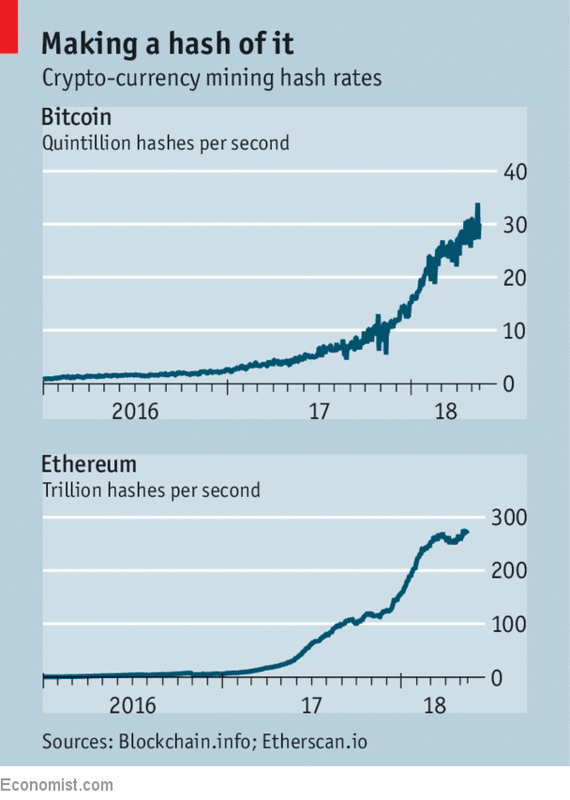 This requires would-be miners to combine three bits of data—a new block of bitcoin transactions, the last block on the blockchain (the ledger of transactions), and a random number—into a “hash”, or a 256-bit string of letters and numbers. The faster you guess hashes, the likelier you are to find a correct one before other miners. Bitmain has come up with mining machines that are custom-designed for each crypto-currency’s hashing puzzle. Bitmain and Bitfury, a Canadian firm, are designing ever-cleverer ASIC chips for their products. Bitmain’s individual mining machines sell for $1,300 each on Amazon, and Bitfury will install shipping containers filled with mining machines for a price that is undisclosed but is thought to be around $1m-2m. Not all crypto-currencies are mined in the same way, however. For bitcoin, the three data inputs to the cryptographic puzzle are relatively small but the maths problem is hard, meaning that chip design hands miners a big advantage. Bill Tai, a board member of Bitfury, says this irks some people in the crypto-community. Bitmain alone mines two-fifths of bitcoin blocks, which undermines the currency’s egalitarian ideals. For that reason, Vitalik Buterin, the creator of Ethereum, the second-most-valuable crypto-currency by market capitalisation, tried to set things up differently. The cryptographic puzzle used to mine ether (the digital coin associated with Ethereum) involves a fairly simple maths problem, but the inputs are enormous. The hope is that this will blunt the advantage of ASICs and prevent ordinary users being squeezed out. Most of those users mine on graphics processing units, semi-specialised silicon primarily designed to generate video-game graphics, but which are good at crypto-currency mining. Those GPUs are available for just a few hundred dollars, much less than dedicated ASIC machines. A few crypto-currencies, such as ether and Monero, are therefore mined using GPUs rather than ASICs. The rising share prices of the two American companies that design most of the GPUs on the market, AMD and NVIDIA, have partly tracked the hash rate of GPU-mined currencies. Firms such as AMD, Bitmain, Bitfury and NVIDIA design their ASIC or GPU chips but do not make them. They are all customers of “foundries” such as TSMC, UMC and Globalfoundries, which manufacture chips for others. These companies are the third category of supplier firm to benefit from the crypto-boom. Last year demand from crypto-currency customers such as Bitmain accounted for $1bn of total revenues of $32bn at TSMC; demand from NVIDIA and AMD will have boosted its sales as well. Slipping prices for crypto-currencies have not dimmed miners’ enthusiasm. Mr Sciarappa laments in his videos how little bitcoin his Antminer S9 churns out now compared with November. He remains hesitant to switch it off, yet firms know that demand could fade. TSMC’s management recently said that the firm is reluctant to add capacity to cater specifically to crypto-currency demand. Bitmain, even though it is helmed by die-hard crypto-enthusiasts, wants to create artificial-intelligence chips for other uses. The firms that have made this virtual gold rush possible have no intention of being flashes in the pan.